Here’s a satisfying collection of chocolate quotes to tempt you. The “food of the gods”, chocolate has been unmatched in history for its taste and importance. Its history goes back to over 4,000 years. Cocoa beans were once powdered and mixed with honey, spices, chili peppers, vanilla, and water to prepare frothy drink and savored by the civilizations in Central America. Today, we know of infinite ways in which this godly ingredient is prepared and enjoyed. Chocolate was the domain of the royals for a long time before the Dutch revolutionized chocolate making in the 19th century. Whether it’s a gift, a treat, a symbol of your love or a personal indulgence, chocolates can be defined in every way. And, lots of folks express their love of chocolate in some well-written verse as with these chocolate quotes. Read on. Nothing is more romantic than chocolate. Switzerland is a place where they don’t like to fight, so they get people to do their fighting for them while they ski and eat chocolate. The way to a woman’s heart is through truth and trust. Well, all except mine. Mine is through chocolate. It takes about 400 cocoa beans to make a pound of chocolate. Think of how many cocoa bean in your kitchen to make your annual chocolate consumption a reality. Chocolate makes everyone smile – even bankers. If singing was a color, it would’ve been the color of that chocolate. Life without chocolate is life lacking something important. What’s your favorite type of chocolate: milk or dark? Try some more. The Strawberries taste like strawberries. Bubbles, bubbles everywhere, but not a drop to drink. You really shouldn’t mumble. because I can’t understand a word you’re saying. There’s no earthly way of knowing, which direction we are going. If the good Lord had intended us to walk he wouldn’t have invented roller-skates. Mrs. Gloop: My son! He’ll be made into marshmallows in five seconds! Wonka: Impossible, my dear lady! That’s absurd! Unthinkable! Wonka: Because that pipe doesn’t go to the marshmallow rooom! It goes to the fudge room! Mrs. Gloop: You terrible man! My therapist told me the way to achieve true inner peace is to finish what I start. So far I’ve finished two bags of M&M’s and a chocolate cake. I feel better already. Chocolate: the poor man’s champagne. Researchers have discovered that chocolate produces some of the same reactions in the brain as marijuana. The researchers also discovered other similarities between the two but can’t remember what they are. If I die eating chocolate, I’ll die happy. German chocolate cake was named after Sam German. He developed a sweet bar for Baker’s Chocolate, and he was not from Germany. 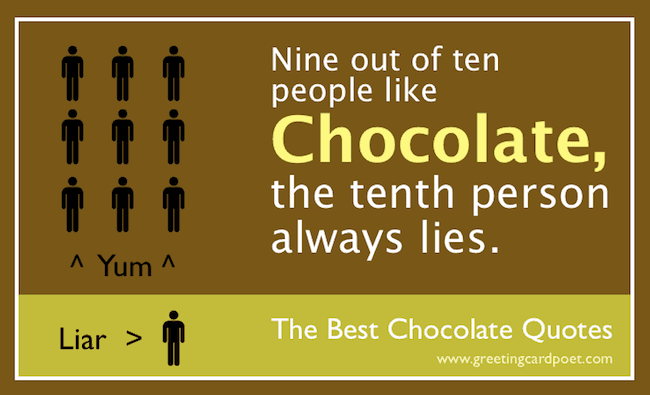 For more chocolate fun facts, visit the National Confectioners Association. Make a list of important things to do today. At the top of your list, put eat chocolate. Now, you’ll get at least one thing done today. Save the earth it’s the only planet with chocolate! Tip: These chocolate quotes make great captions for photos on Facebook or Instagram. The divine drink, which builds up resistance and fights fatigue. A cup of this precious drink (cocoa) permits a man to walk for a whole day without food. Fruit of all the kinds that the country produced were laid before him; he ate very little, but from time to time a liquor prepared from cocoa, and of an aphrodisiac nature, as we were told, was presented to him in golden cups…..I observed a number of jars, above fifty, brought in, filled with foaming chocolate. of which he took some…..
On hot chocolate: It flatters you for a while, it warms you for an instant; then all of a sudden, it kindles a mortal fever in you. The world won’t get more or less terrible if we’re indoors somewhere with a mug of hot chocolate,’ ‘Though it’s possible it will seem slightly less terrible if there are marshmallows in the hot chocolate. Does chocolate taste better melted or in solid form? If you have any suggestions for chocolate quotes, please let us know via the Contact page. Thanks!